Reliving a Memory is a work based on the 1950 diary of George Blakslee. Qaryat al Fau was known to its residents during the early centuries of the Christian era as Dhat Kahil. The town was of considerable importance, for it was on a caravan route for the transport of frankincense and myrrh from eastern Yemen and the Hadhramaut to the Persian Gulf and southern Iraq. When George and Gierhart visited its ruins in 1950 little was known about its history, although it was thought to have been under the sway of the Himyaritic dynasty centered in the town of Zafar in southern Yemen. 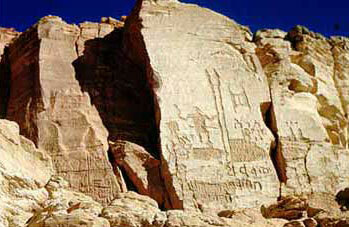 That it predated the Moslem conquest was obvious, for the inscriptions on cliff walls near the ruins are in an alphabet far removed from that of Arabic, although like it in the omission of written vowels. That alphabet is now known to be Sabaean, in the variant called South Arabian. Ansary (1981) notes minor differences in epigraphic styles and Ryckmans suggests Lihyanic (North Arabian) affinities for some of the inscriptions. The town, already in existence in 200 B.C., became the seat of power of the Kindah tribe which expanded its hegemony northward from the western Hadhramaut in the fourth and fifth centuries A.D. One of its kings' invaded Iraq, but was in turn invaded and overthrown in 528 A.D. A century later the newly expounded Moslem religion and its proselytizers swept all before them. But here we deal only with what can be gleaned from George's photographs. They show the considerable area covered with the fragmentary, light-colored remains of buildings, some of which include architectural details, along with surface traces of their walls. Large mounds, tels, have been shown to be the ruins of the more important of these constructions. Several of them have been excavated by Professor Ansary and his crew of university instructors and students. They include a market (suq), a temple and a palace as well as many residences and tombs. According to Ansary, some of the ‘towers' are either mud-brick funerary monuments (one is close to the tomb of a notable) or the corners of structures more sturdily built than the other parts of the building and thus more resistant to erosion by wind and water. The large mound on the horizon rises 25 feet above the level of the plain. 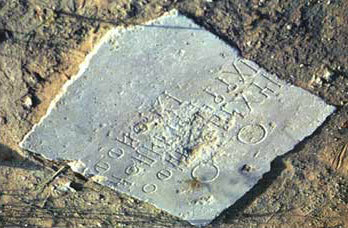 When investigated it was found to be the site of a two-story building 100 feet long east-west and 83 feet wide. It was enclosed by a triple wall , the outer one being the oldest of the three. The interior of this large structure was divided into small shops facing a central walkway. Other shops of less massive construction were found outside this core building. The 'tower' with projecting supports in the middle distance and closest to the camera is but a few tens of feet outside the east end of the market. Made of mud bricks, it rests on a base of limestone blocks and has a core of white sand that may have served to filter the water supply of a deep subterranean reservoir under the market. The other six 'towers' had no such purpose. In the small inset map accompanying his note of 1949 Philby has indicated the approximate locations of twenty-two of these 'turrets', as he called them. 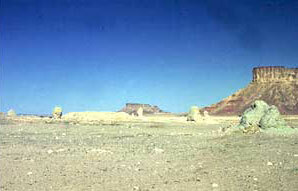 In the foreground is the white trace of the walls of a building smaller and less massive than the ruins of the suq that comprise the tell. It is worthy of note that most buildings have the long axis oriented east-west. 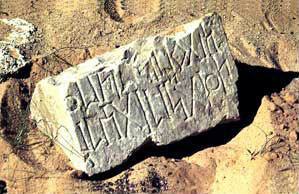 Among the widely scattered debris are limestone blocks with inscriptions in the Sabaean alphabet. The photo on the left depicts one such block. Many of these inscriptions have been found to be dedicatory plaques to an individual or family concerning the construction of a building or tomb. This one was photographed upside down. Like Arabic, the words read from right to left and vowels are not written. The first four letters are the equivalent of the English B (half missing) L H T. A vertical bar serves as a separator to mark the end of a word Then comes an L (another separator) BUT (separator) PN. The second line reads [Glottal R] PN (separator) L B. The two following letters are illegible, and the final letters are B F T H. Dr. John Hayes, Professor of Middle Eastern Languages at the University of California, Berkeley, kindly made a translation of these lines: The first reads: "PN daughter of PN" and the second: "servant of ?? PN." LHT is the second part of PN, "Goddess." 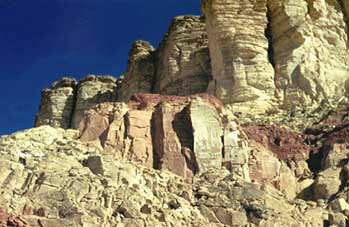 The two large circles are at the top of the limestone slab. Unfortunately, much of the inscription is defaced. The small circles with a central line are W's and the key-shapes are Y's. Dr. Hayes found two decipherable words: "his/her daughter" and "life". Artifacts lying exposed on the ground reveal the architectural skills of the inhabitants of Qaryat presumably developed during the first half millennium of the Christian era. Ansary found small sculptures in stone and metal whose characteristics he inferred to suggest that this interior way station was in contact with the civilizations fringing the Mediterranean. But indigenous albeit more primitive works of art also exist in the region. 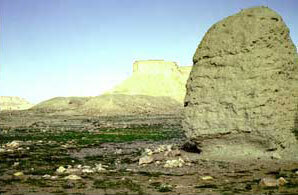 Below an erosion-resistant capping of dense white limestone, muddy hematitic limestones make up much of Jebel Tuwaiq in this, the southern portion of its 400-mile length. Near Qaryat al Fau a tall figure holding two very long spears in his left hand is outlined on this less indurated surface. Much larger than life, the figure wears a knee-length garment, has a hat or helmet, and a sword projects on both sides of his mid-section. The artist took advantage of the fact that incising the almost white surface of the weathered slab produces a reddish-brown line. Three areas of writing on brown irregularly-shaped plaques are near the figure, and other larger letters are incised in the whitish surface. Ansary suggests that this figure represents the principal god, Kahl or Kahil, of the local pantheon. 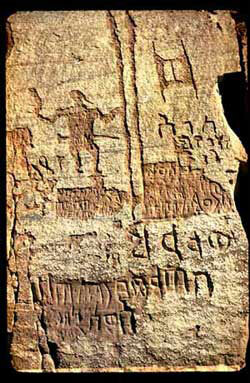 The graffiti are on a slab of hematitic limestone near this incised drawing. Another example of cliff art in this area was not photographed. It depicts horsemen armed with spears hunting ostrich and gazelle or oryx. It is several miles from Qaryat and no writing accompanies it. It may not be of the same culture. An even more enigmatic display in this area are the long rows of stones closed with V's. 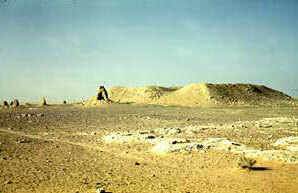 There are at least two such sites, both at some distance from Qaryat. Their purpose and significance are unknown. A religious connotation has been suggested. The stones are not worked, but fall within a limited range of sizes. The religion of most of the the residents of Qaryat appears to have been oriented toward a pantheon of gods and goddesses of whom Kahil was the head. But Ansary's discovery of a sacrificial altar in the form of a bull, and a torso of the Roman goddess of wisdom, Minerva, suggest that the official faith of the Roman Empire had filtered in some degree to this isolated outpost. The bull was an important symbol in the cult of Mithra (originally Persian) as practiced in Rome. The virtual identity of some of the rites of this cult with those of Christianity are striking, including the choice of December 25th as a day of celebration. But the settlement at Qaryat al Fau was founded at least two centuries before the dawn of the Christian era, and before some Romans embraced the Mithraic cult and adapted it to their mores. A more mundane question: why did a settlement come to be? is answered, at least in part, by the well described by Philby in his 1949 note in the Geographical Journal. Some 3800 feet south-southwest of the largest tel, dug in hard bluish limestone, the well is almost a hundred feet deep and yields slightly brackish water without fail. Perhaps it was dug by settlers who would thus profit from service to passing caravans, but a Himyarite ruler may have ordered it dug to facilitate the transport of his shipments north. 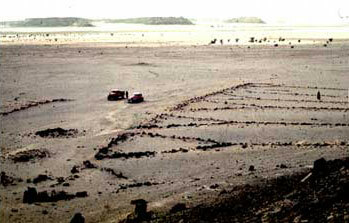 Centuries of camel droppings have raised its now pentagonal rim six feet above the pristine ground surface. George saw another well, now dry, within the confines of the ruin field. Ansary suggests that a straight furrow bounded by masonry that runs nearly a mile from the foot of the cliff to the northwest part of the town is the trace of a canal. 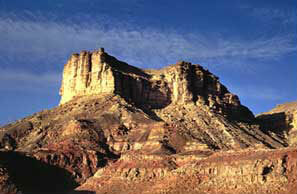 If so, then the inhabitants of Qaryat had found other ways to obtain water. With this in mind Ansary interprets circles of stones as evidence that trees were irrigated, using methods adapted to an arid climate, and many querns as proof that grains were cultivated. Means for water storage existed in nearly all households, and subterranean canals linked some of them. All of these observations and their interpretations are of interest, but study of the ruins was not the task for which George and Gierhart had been sent to the region. Their assigned work was to carry out a reconnaissance geologic and topographic survey that would determine the desirability of a more detailed search for oil in this distant and difficult region, and, as a corollary, its accessibility.